I've long believed that for my work, seeing by itself is insufficient to create a good photograph. Whereas visual skills are essential, they are only a part of the contribution we can make as individuals or artists to our photography. The real skill of the visual is translating whatever it is we're trying to say into images; an extra level that might go some way to communicating our intent. Beyond seeing lies the murky, complex world of ideas, motivation, intent and meaning. The differences are often difficult to intuit; yet it makes all the difference when a photograph is part of a process that is beyond the photographic process itself. It's an area that's difficult for us all to grasp, simply because it's so vast and complex. And once grasped it is equally easy to lose hold. It does, however, go to the root of what makes a good photograph - all those ideas that lie behind the image that might occasionally be glimpsed by the viewer. Perhaps it's simply that we should think of ourselves as authors of photographs, rather than ’takers’. Even saying nothing is significant if it's a conscious decision. So when I learned that Colin Pantall and Max Houghton were organising a day long series of talks called Beyond the Visual: Sound, Word and Landscape in Bristol this November, understandably my interest was piqued. Even more so, as ’word’ is something that I've long used to help both develop and present my own photography. I’ll happily admit I haven't really explored sound at all until very recently, but it is undeniably an element in most landscapes, even silence is significant. The speakers included Angus Carlyle, a landscape sound artist; Beth and Thom Atkinson the photographers behind the Missing Buildings series; Max Houghton senior photography lecturer at the London College of Communication talking about the literature of the landscape; Jem Southam, landscape photographer and Professor of Photography at Plymouth on the importance of walking; Paul Gaffney best known for his series “We make the path by walking”; Ester Vonplon, a Swiss photographer who's beautiful images of glaciers were a standout part of the day for many; and finally Susan Derges, best known for her photograms of rivers and streams in north Devon. In his introductory speech Jessie Alexander spoke what for many landscape photographers might think the unthinkable “I always got the impression there was something a little distasteful about the genre [landscape photography]”. He admits that this initial impression was unfounded, but that it still conjures up a whole series of derivative clichés and that it’s little wonder that many contemporary practitioners don't want to be associated with the genre. And that while the New Topographics movement revised the genre, today's speakers are finding new ideas to move the genre forward. Picking up on Jesse’s introduction, Max Houghton discussed how the New Topographics had moved the genre forward by celebrating ’the beauty of the banal’. But she suggested that detachment isn't the only possible response and that there's a need for an aesthetic shift. She said there are “other secrets beyond the patch of land”. Equally she questioned the “moral imperative that immersion in nature helps us live a better life”. And that it is poets, painters [and photographers?] 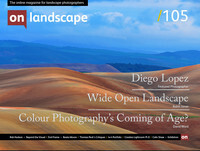 who help create the ’idea of the landscape’.